If anyone is interested in more information or history about the Ionia Free Fair you can check out our website at www. ioniafreefair. com and we are also on Myspace and Facebook. I would be interested in either purchasing or paying for reproduction of some of the photos that Brian Norton & Don Betts have submitted. If they are still active in checking this site please email me at choz33kat@yahoo. com. Thank you. I stand corrected John Doering and I remember him, as well. 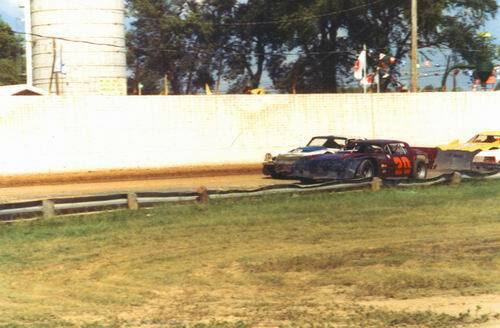 Is the picture taken at Ionia Fairgrounds of the #97 Stroh''s car none other than Ray Daniels, who I believe hailed from the Flint area? I would also like to know who submitted the picture of Pete Weiss, I''d be interested in purchasing a copy of it. 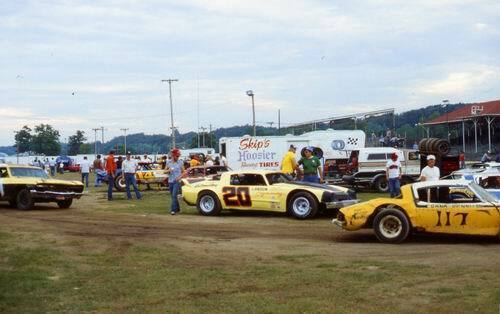 Looking at the photos of this track from 1978, that could have been the year we went and watched a race there. I think it was earlier though. 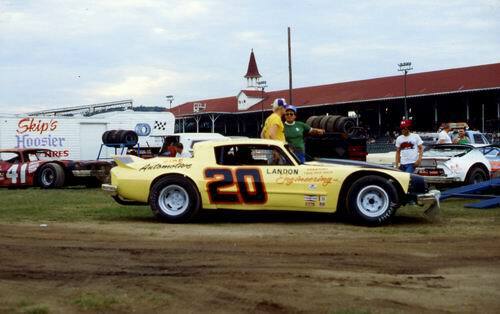 But while I can''t say as I remember Dean Crosten, I do remember hereing of the name on one of his Camaros; Landon. It was Wayne Landon I think. 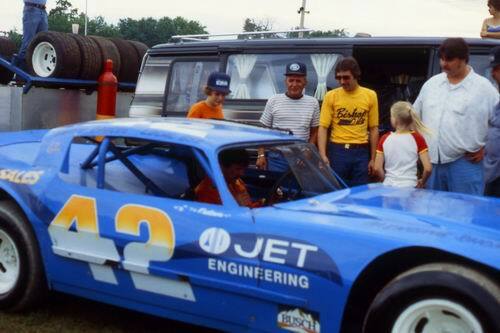 He used to race and set up a lot of winning cars back then. I went to Lake Odessa to the fair to watch a midget race back in the early 80s and saw his boy run a midget w/Chevy II 4 slanted almost on it''s side with a V8 head on it. Now that took some engineering! 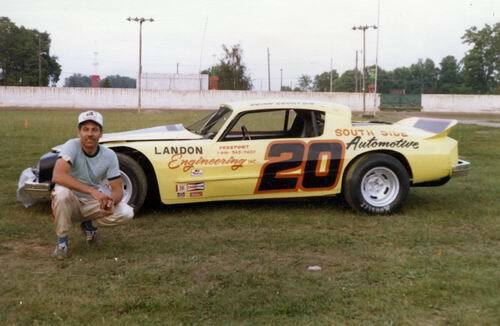 I think Landon was the other big name chassis/car builder around back then(Ed Howe being the most well known). Pretty neat stuff. There have been some MAJOR renovations to the speedway. All of the light poles on the inside of the track have been removed, the inside wall through turns 1 & 2 is gone, and the track is now over 70ft wide at its narrowest point. The fair is continuing to make many more safety improvements as well. The SOD sprint cars will be there on July 18, 2008 for the first time in 25 years. 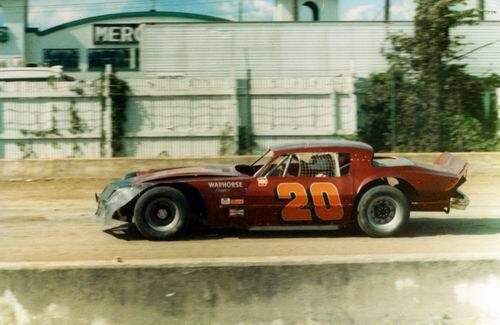 They still run late models and modifieds a few times a year. just some info I found regarding the fairgrounds. 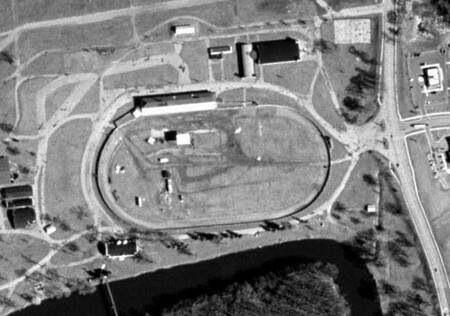 The track appears to have first run cars in 1925 on a 1/2 mile dirt oval. The track operated with brief breaks through August, 1941. 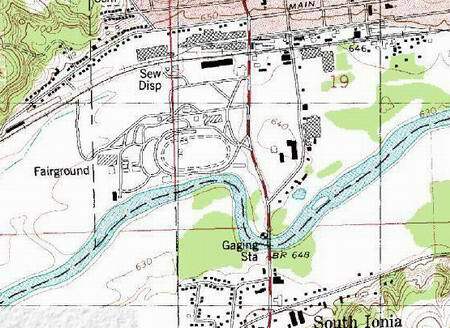 Operations resumed after WWII on August 10th, 1946, continuing until 1982. A 1/17 mile figure 8 opened in 2001. The Ionia Fairgrounds is hosting a RACE CAR SWAP MEET this weekend - 10/21 - Sunday. I was 11 in 1961 but still remember my Dad taking the #66 chevy sprint car there with Norm Rust as the driver. They had just returned from the Little 500 in Anderson Indiana. Not sure but believe they set quick time and won their heat and feature. 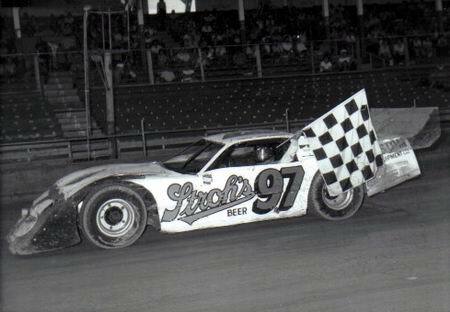 Norm was a great driver and performed well on the dirt and pavement. Man I wish we had those days back. 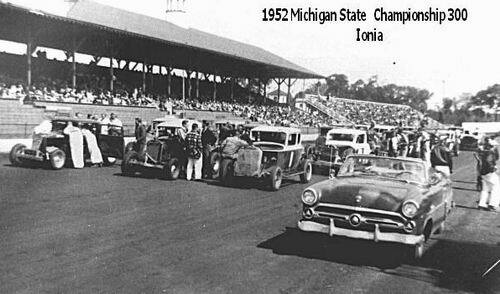 The Engines Roar Once Again at the Historic Ionia Fairgrounds Speedway! 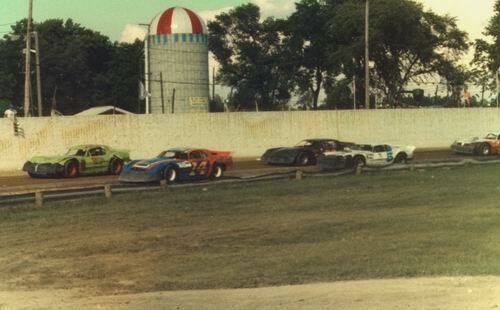 After a layoff of nearly 23 years, the historic 9/16ths mile Ionia Fairgrounds Speedway is making plans to open its doors to fans and racers on one of the most historic days of the year, July Fourth! Promoter Jay DeJonge calls this the Michigan On Dirt Series and in its inaugural season, he intends to run five events, beginning with the race on the Fourth. Other dates will include July 21st, August 7th, August 28th, and September 11th, 2005. All events except the July 21st date will have gates opening at noon with racing starting at 4PM. July 21st has gates opening at 4PM and racing at 7PM. Due to this being held during the Ionia Fair, there will be a $5 fee to park. Each night will feature a three division race card made up of Late Models, Modifieds, and Sportsman Stock. Each event leading up to the Championship night of September 11th has a purse of $1500 to win and $150 to start for the Late Models (25 laps), the Modified purse will be $750 to win and $75 to start (20 laps), and the Sportsman division pays $500 to win and $50 to start (15 laps). The September 11th Championship night features will be five laps longer and the purse will be $2000 to win/$200 to start for Late Models and the Modifieds will race for $1000 to win/$100 to start.